In the following interview with David Prater, John discusses his editorial philosophy, the future of the global internet and the mystery of his missing moustache. Can you name an editor whose work you admire or respect? Doctor Johnson, Beatrice Davis (Angus and Robertson, 1960s and 1970s), the conjoined twins Michael Heyward and Peter Craven (Scripsi, 1980s), and several others. 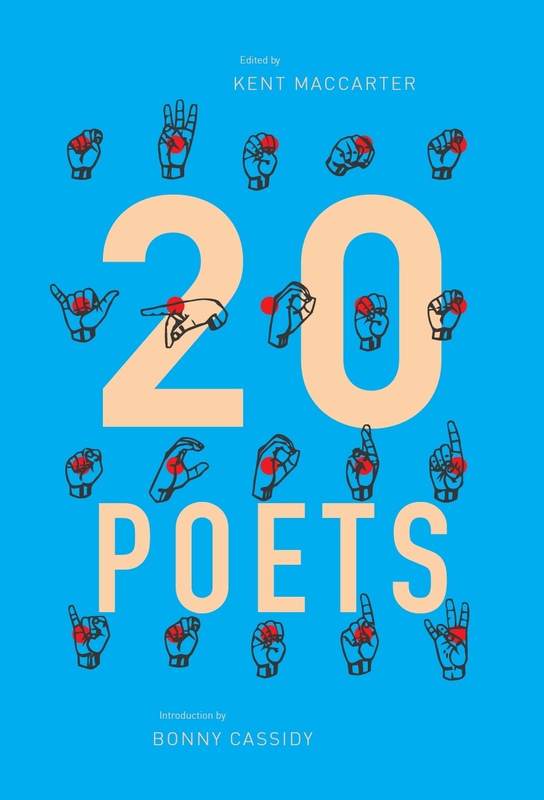 What would you say are the ideal attributes of a good poetry editor? To have a natural talent for the English language, to train oneself thoroughly in using it well, to read widely in ancient, Renaissance, modern, radical and conservative literature, to be tactful, forceful, bullying, gentle, charismatic (in order to inspire selfless slavery in others), modest, greedy for fame, and – this is essential – slightly mad. That is, rather mad, but capable. Needless to say, there are no ideal editors, only editors who approximate to the ideal in varying degrees. Having read some of the material online about your first collection, Parallax, and the interventionist role played by Grace Perry in its publication, I'm wondering if you subscribe to the view that there are certain periods of time when editors have the opportunity to have more impact than at others? An insightful editor can stop a stupid manuscript from seeing publication, and force a flawed but brilliant one into print, as well as gently but firmly turn a sow's ear of a manuscript into a silk purse of a book. They can also, if they have the qualities of a good general, take advantage of propitious times and harness the social energies around them. If their taste is flawed, they can spoil a writer by publishing his or her meretricious work; and all writers create meretricious work from time to time. Well, the northern-hemisphere magpie is like the austral bower-bird, gathering pretty fragments to adorn its nest. I think it was Robert Adamson who laid claim to the role of chief magpie in this continent. In Ultra I was trying to cram everything into the stream of poems in that book in the hope of overwhelming my natural tendency to settle into a stable rhetorical tone of voice. Maybe I overdid it. Some of those poems also contain buried within themselves fragments of older poems by myself and others, mashed into a different form in the blender of art. I also didn't want to present a coherent personal philosophy in that book: that is, I don't think I have any answers to the problems of living in the modern world, or any particularly important insights into the meaning of life, just a lot of questions. I don't think writers should tell people what to believe or how to behave. So I let lots of fragmentary, sometimes contradictory opinions ? as though they came from a large cast of different characters ? into the poems. That's what life is like, after all. Just listen, next time you take a bus into town. Millions of different voices, each as important as your own solitary whining. But Jacket – you're right, Jacket is a very eclectic kind of venue. There are pieces in there that are so experimental they make your teeth ache, and there are gentle conventional nostalgic poems too. When I began exploring the world of poetry, I found a wonderful range of achievements available to me, all around the world, in various cultures and languages. I drank them all in. It seemed wrong to limit my interests to one kind of poetry. I wanted to show some of that wide range of theme and topic and style in Jacket. Poets who are psychologically chained to one style or approach might well find things in Jacket that offend them; open up, is what I say. On the Jacket site you make it quite clear that you generally do not accept unsolicited submissions, so what is the philosophy behind your solicitations? When I started Jacket I knew that if I said I was open to submissions from the general public, I would be overwhelmed by millions of submissions from all over the world. I just had to protect my time; already Jacket takes up a lot of my working life. That's a shame, but that's life. Jacket is for readers to read and enjoy, not for writers to use as a ladder to fame and riches. And if you can't publish in Jacket, publish somewhere else: there are literally thousands of magazines out there. Or – better still – start your own magazine. I started out writing to people I knew, or writers whose work I liked. It just expanded slowly from there. I have always regretted that I can't pay for contributions, but I can't, and that's it. I have always been surprised that no one has declined to send me something if I ask, and that no one seems concerned that I can't pay. One thing that strikes me about Jacket is its a-temporality – there seems to be no logical beginning or endpoint for each issue. How do you know when an issue is complete? Do you have a certain quota in mind? I guess I think of it like a printed magazine: when it seems full, I close an issue off. I don't want to force people to wade through the whole five thousand pages (which I think Jacket probably amounts to by now.) They'd get lost and anxious. I guess an issue of Jacket averages around two hundred printed pages, like Meanjin or Scripsi. With regards being an internet magazine, and your 1999 article on the subject (‘The Left Hand of Capitalism') – do you think that the rhetoric of freely available information on the Internet presupposes a certain level of access to that information? Is there any point in ensuring that pages are accessible to the person with the slowest connection speed when that person's neighbours don't have Internet access at all? To get this into perspective, we should remember that more than half the people alive now have no access to a telephone. So the Internet is an elitist thing. On the other hand, nutritious food is an elitist thing too, on that same scale, and we in the developed West have a right to demand nutritious food for ourselves and for our children, no? It's a matter of context. As with all social exchanges, it's a compromise. Early on I designed Jacket to be fairly easy to download; I make the graphics fairly small and compressed, I don't use video (though I'd like to), and I keep audio to a minimum, all to make the thing less bandwidth-intensive. I used only dialup myself for years, both to download and to upload material, and I see that as a basic minimum. Jacket should, I hope, work reasonably well over telephone dialup. The article also talks about subscription models on the Internet as being doomed to failure, and suggests that information wants to be free – do you also see a trend at the moment towards self-funded communities, for example within the open source movement? I'm thinking here of an application like Movable Type (which Cordite has used, with mixed feelings) and its move towards a subscription model, or the obvious capitalistic intent of Google, and its buyout of previously open source content applications like Blogger – while I'd agree with you that freely accessible material seems to be the intuitively right thing to provide on the Internet, do you have any misgivings about the future of free content? Any dystopian nightmares? The market economy sure is a horrible beast: it seems to want to consume everything. Yet the open-source movement is still alive and well. I'm heartened to think that the OpenOffice suite, that is, a free alternative to Microsoft Word and Excel, seems to be doing well (that is, in June 2005). Selfishness and greed are generally triumphant, yet altruism keeps poking its head up. As long as people want to write and read poetry, there will be magazines like Jacket around, in one form or another. I remember you were involved with the OZAuthors trial – can you tell our readers a little bit about it, and your own opinions of commercial e-book trials? 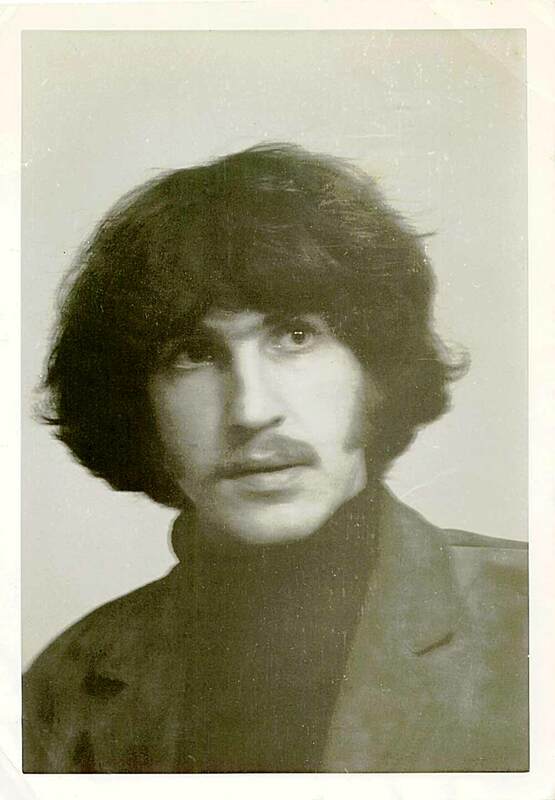 I should make it clear to those who remember the sixties (lucky people!) that the OZAuthors trial was not the trial for obscenity of the (mainly Australian) editors of Oz magazine in London, which started in June 1971 and was the longest and most famous obscenity trial ever staged in Britain up to that time. No, the OZAuthors trial was a test of the effectiveness of placing creative writing on an Internet site managed by the Australian Society of Authors. It was a brave early attempt, and was not all that well thought out or managed, and in the end it was put to sleep. Electronic books don't seem to have worked very well. No one likes reading off a screen for long, if they can help it. The screen is full of glare, and the text is not very clearly-defined, and everything jerks up and down when you want to see the next page. I think Print-on-Demand (POD) has more promise. It is a means of delivering printed books of poetry cheaply. My last three titles were printed that way, by Salt Publications in the UK. (http://www.saltpublishing.com/). It solves the horrible problem of needing to print a thousand copies to get the unit cost down, which is what you needed to do in the photo-litho days. With POD you can print twenty copies, and then when they sell out, another ten or a dozen. No warehousing problems, no assets tax. But the Internet and other electronic forms are very useful for large compilations of material which people need to browse through for one or two things they might want to read, and which would be far too large to risk printing on paper. When Philip Mead and I compiled the Penguin Book of Modern Australian Poetry in the early 1990s, the publishers had to limit the number of pages for cost reasons, and then we ran out of space for the author notes, which had to be left out. 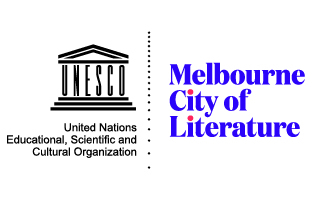 Now I'm compiling a database of Australian poetry on the Internet which has virtually no page limits: http://www.austlit.com/a/. All those author notes can be made freely available at last, and voluminous notes, too, with lots of photos and other things that a printed compendium could never afford to publish. To what extent do you think your work as an editor has been influenced or shaped by your experiences in the printing/ publishing industry? Do you think it's necessary for editors to be familiar with the processes or printing and mechanisation? Influenced? A lot. In fact I see the Internet not as some marvellous electronic device that lets you create multi-dimensional text in coloured blinking lights with thousands of hypertext links and alternative endings, but simply as a cheap way to distribute well-designed books and magazines all over the world. For most of my adult life I have studied type and page layout and graphic design and typography and spelling and syntax and grammar, and I bring all of that to Jacket, just as I brought all of that to my work as an education editor for Angus and Robertson Publishers in Singapore in 1972. In 1968 I started a poetry magazine called Transit which I printed on a Multilith 1250 photo-litho printing machine. It only lasted two issues: prescient title. Jacket is really just that same magazine, produced more cheaply, with a much larger contributor base and a much larger audience, nothing more. Each page is designed on the same principles: clarity and readability first, attractiveness next. For the Internet you have to add ease of navigation, that's all. How much work do you put into Jacket? How many hours a week do you put in? How does this affect your own creative writing? I'm frightened to count the hours I have spent on Jacket since the first issue in October 1997. I think I'd burst into tears. Twenty to thirty hours a week? And yes, over the eight years I have been its slave, it has stolen about forty good poems from me. Too bad. People write too much anyway. I could mention some names, but I won't. Finally, a little bit of a cheeky question: when I read the aforementioned material on Parallax, I was especially interested in the bio and photo on the back cover (left). I remember John Scott saying to me once that he abandoned the A from the name John A Scott after he stopped publishing books of poetry, saying that that person was a different person, who no longer existed. With the John E Tranter, was a similar operation in progress there, even in spite of the confusion with the other (since disappeared) John Tranter? Further to this, I notice you sporting a rather dapper moustache in that self-described “gloomy” photo – what made you shave it off? Or was that indeed a stand-in Tranter, like the other Paul McCartney beloved of conspiracy theorists? Damn, you've found out! Paul will be so upset! He wanted his serious poetry to find its own way in the world, unencumbered by his fame as a pop singer? 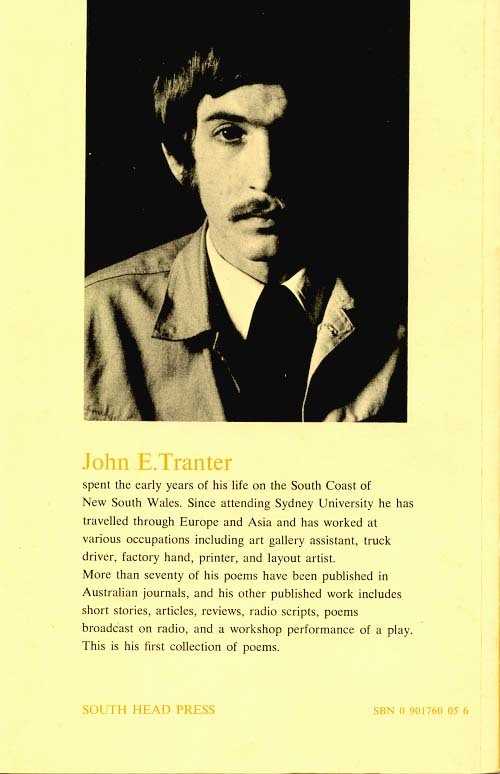 Seriously, I didn't want to have to call myself John E Tranter, but when I was twenty-one, in 1964, a novel appeared in London titled The Livin' is Easy, by a young Australian writer called John Tranter. There had never been a published writer of that name in English, as far as I know, and I was dismayed; the novel wasn't mine. I found out, years later, that it was by a writer (born in New Zealand) named John Taylor Tranter. We talked once on the phone: he seemed a nice guy. He's dead now, unfortunately. But at that time I felt obliged to use my middle initial (E for Ernest) to distinguish my work from his. As it happened, he never published another book, and eventually I dropped the initial. That's what that was about. That was about when I cut off my moustache, in order not to be confused with Paul and to escape being mobbed in the streets, but in later years I grew a moustache and occasionally a beard, on and off, from time to time, but not for a long while now. Last time I grew a beard, I thought it made me look like Santa Claus, and that's where cognitive dissonance raises its ugly head: Santa Claus? That's not quite me. This entry was posted in INTERVIEWS and tagged David Prater, john tranter. Bookmark the permalink.